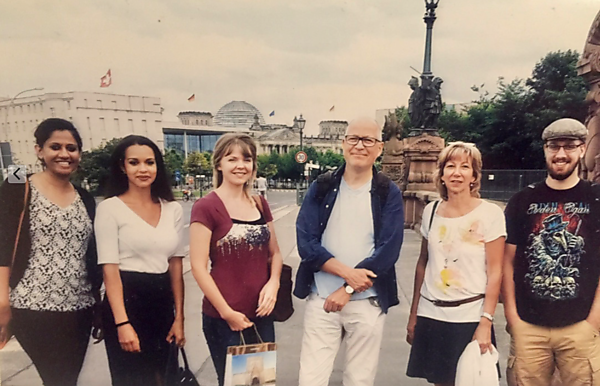 Kati O’Brien, a final-year student in Biomedical Sciences from Plymouth University, has returned from a six-week visit to the Robert Koch Institute in Berlin where she worked with a group studying Mycobacterium bovis (Mb), the cause of bovine TB in cattle. The trip was designed by Dr Michael Jarvis of Plymouth University and was funded by the Seale-Hayne Educational Trust (SHET), which aims to support higher education and research in the fields of agriculture, rural land use and related disciplines. Kati is the third student to be involved in this exchange, which has been funded by a grant awarded initially in 2014. The project which Kati worked on in Berlin, and for which Michael Jarvis and Plymouth University are partnered, involved investigating types of a herpesvirus found in different species of infected badgers, with the aim to develop a spreadable or single use conventional vaccine to target the transmission of Mb from badgers to cattle. This project may also give insight into human TB disease. The project is carried out under the supervision of Dr Bernhard Ehlers from the Robert Koch Institute.